3. Ears - Cut out 5 minutes, Sew blanket stitch and inner ears and stuff 40 minutes. 5. Legs - Cut pattern pieces 20 minutes, sew on machine and turn inside out 20 minutes. 6. Arms - Repeat legs method. 40 minutes. 7. Fingers and Toes - Bonda web the top and bottom together and cut out individual toes and fingers 30 minutes. Hand sew blanket stitch round each one 1 hour. 8. Positioning & Stuffing - Position Ears, arms and legs within the body pieces and sew the body pattern pieces together on machine making sure everything will be in the right place when you turn it out 30 minutes. Stuff him 5 minutes. 9. Wings - sew design on each wing 10 minutes. Back the wing and sew round with blanket stitch 40mins. Sew each wing onto the body by hand 20 minutes. 10. 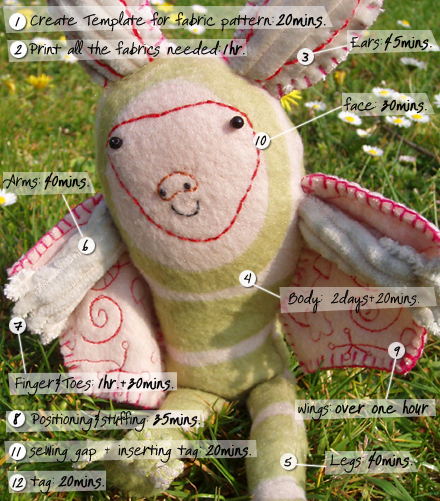 Face - Sew features and attach eyes 30 minutes. 11. Sewing - Sew up the gap by hand inserting tag 20 minutes. 12. Tag - It took 2 hours on the computer to design and 1 hour to print and cut out. SO adorable! I love him and I love hearing how Rebecca brings him to life! Handsewing the little fingers and the design on his wings....wow.